I was born and raised in Arlington Heights where I still reside. I love it because it’s far enough away from the hustle and bustle of the city but it’s only a short train ride away. I truly get the best of both worlds. I attended Hersey High School where I played football and basketball and I went on to graduate with a degree in marketing from Northeastern Illinois University. I’m a huge Chicago sports fan: Cubs (this is finally the year! ), Bears, Bulls, and Blackhawks. I come from a family of coaches and educators, so I love watching and attending all levels of sporting events. I enjoy golf even though I’m not exactly what you would call “good.” It’s the few perfect shots per round that keep me hooked and coming back for more. I grew up spending my summers in Northern Wisconsin and, more recently, Door County, so I love the outdoors and being out on the water. Working with first time home buyers gives me an opportunity to be involved in such an important part of someone else’s life. Buying a new home, especially for the first time, can be stressful and overwhelming. I believe that with my friendly and confident demeanor, I can relieve the pressure and guide you through the process while also making it fun and exciting. See Below to Read Some of Fred’s Rave Reviews! “After years of living in apartments in the city, my husband and I decided it was time to move img_4601to the suburbs after we had our first child. 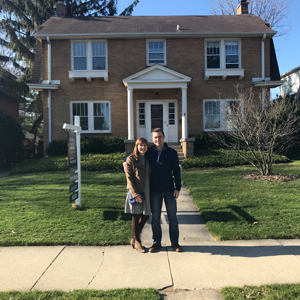 We found an amazing home in Mount Prospect that we both love, and we are excited to raise our family here. We owe that to our Realtor, Fred Lussow. Our home search began a long way from where we ended up, but thanks to Fred we were able to figure out exactly what we wanted – and where to find it. Throughout the process, Fred served not just as a professional advocate, but also as an insightful and caring adviser. He listened to our wish list and provided his own ideas without being pushy. Because my husband and I were first-time homebuyers, there was a lot we didn’t know. Fred provided us with easy-to-understand materials to help us navigate the process and explained the complexities to us so nothing came as a surprise. He was patient with us and well prepared, even after viewing at least 30 listings. His goal was clear: He wanted us to find a home that would give us everything we needed. Fred’s natural ability to work well and communicate with everyone around him served us well as buyers. Most importantly: We have worked with other Realtors in the past and did not purchase homes from them because we didn’t feel they had our best interests at heart. Other Realtors made us feel like a number or part of a quota they needed to fill as quickly as possible to make a commission. Fred was the exact opposite. He made us feel like our home buying process was his most important and primary focus from beginning to end.